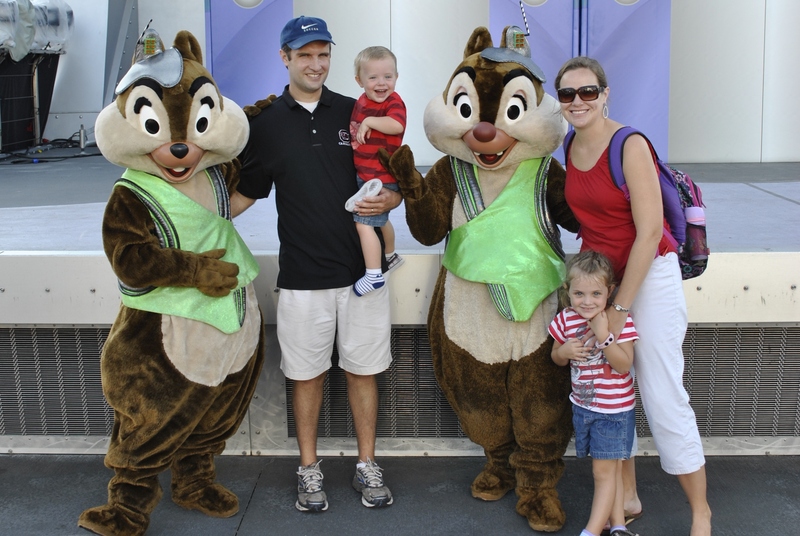 So…we went to Disney World a month ago. It was a GREAT trip, and I’m so thankful to my awesome parents for making it happen. We can’t wait to go back. I think Russ and I may even make that our 10 year anniversary trip. My parents went for their honeymoon and Russ’ brother and sister-in-law went for their 10 year, and we think they’re onto something. 10. 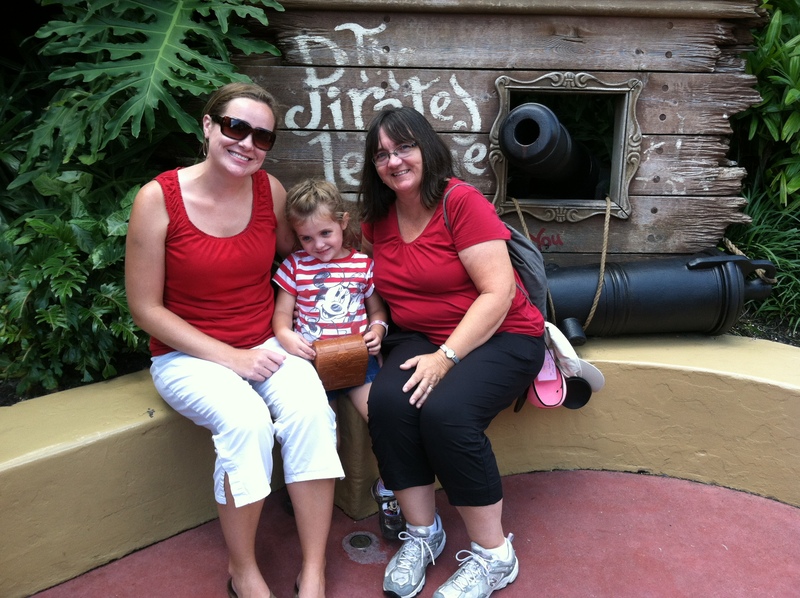 The Food – we were on a “free” meal plan because we came during a low season and got a deal. 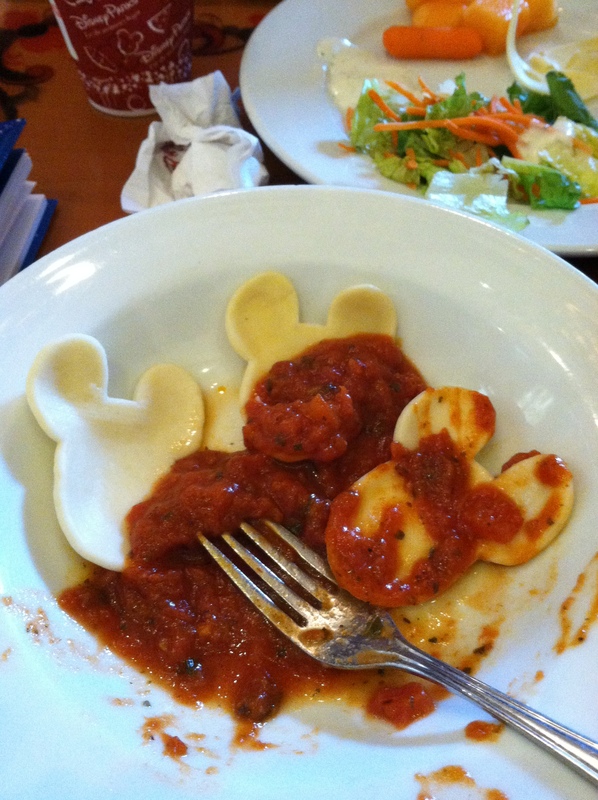 We ate so much food, and I love how Disney incorporates the Disney magic into everything – even Mickey shaped pasta! It was all so good. We had a character meal everyday that was included in our meal plan. The kids loved these (and so did the adults). 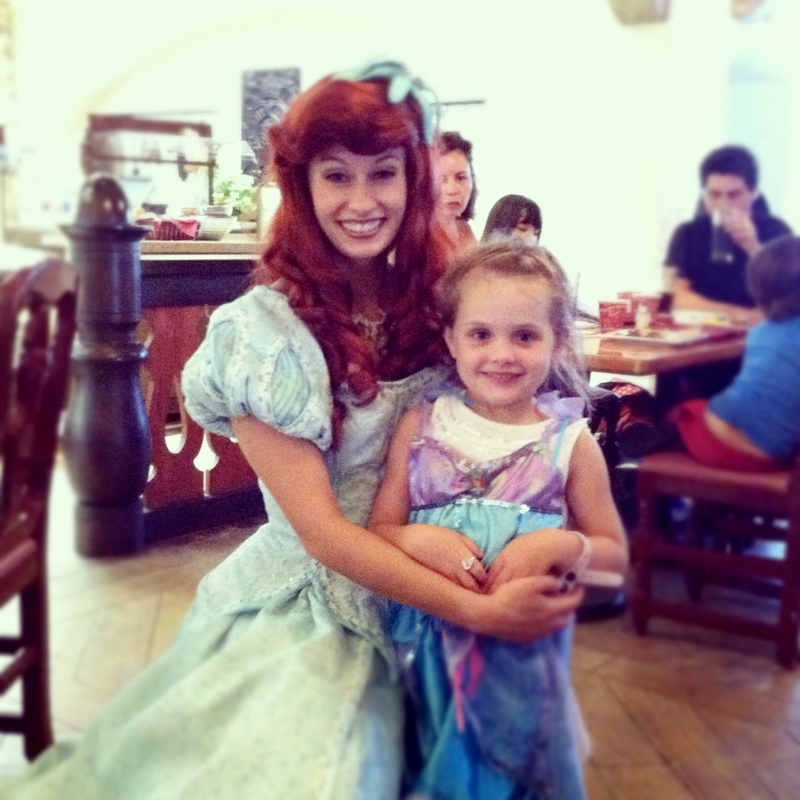 When you ask Taylor what her favorite thing about Disney was, she’ll tell you having lunch with the princesses. Good Times. 9. Charlie’s – OK, so we’re still on food. We left one night after the kids were ready for bed to go to a steak place called Charlie’s that the boys went to when they went down to Orlando for the bowl game in January. Special thanks to Grammy for staying behind with the sleeping children (we didn’t leave them unattended). The boys had been raving about these steaks for eight months, and boy, were they not exaggerating! SO GOOD. The bison was my favorite (I ate bison!). If you go to Orlando, I highly recommend it. It’s expensive, but so worth it if you want a night to treat yourself. 8. Family. It was so much fun to spend the week with my family. 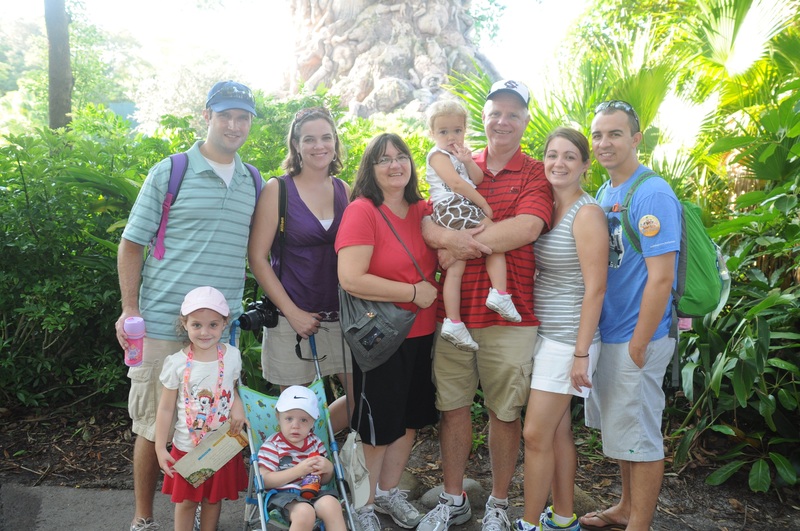 We haven’t done a family vacation since a cruise the summer before Russ and I got married – NINE years ago. So, we were due! It was so much fun to hang out with my family of origin and to see the kids all hang out together for more than just a day or weekend here and there. We were on a little ride, but it went through a dark section. My niece was not a fan. When we came back out into the light, we saw that Taylor had put her arms around her to keep her safe and reassure her. GAH! 6. The Shows. The talent at Disney is quite impressive. The Festival of the Lion King had former Olympic gymnasts playing the acrobatic monkeys! Finding Nemo, the musical was just spectacular! All of the shows kept even Caleb’s attention for 30-40 minutes, which is a small miracle. 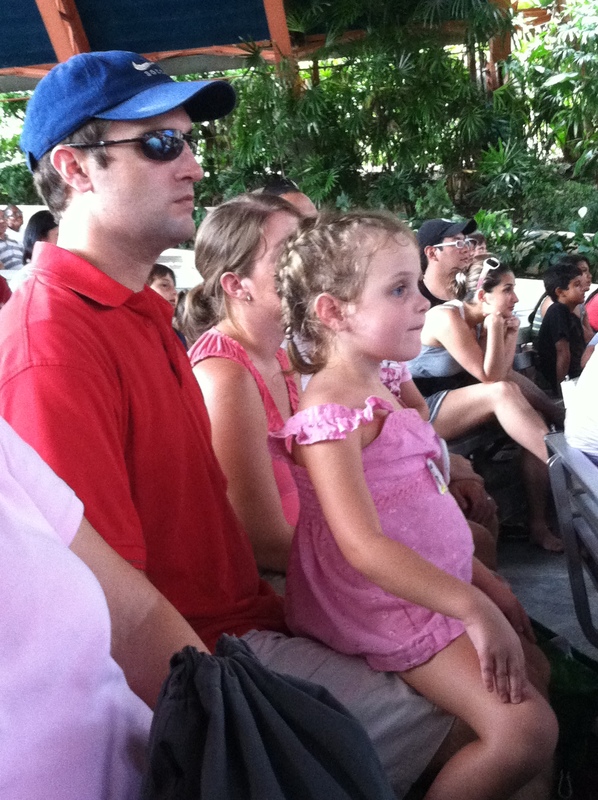 During Nemo especially he sat so still, memorized by the puppets and bubbles. Just fantastic! 5. The little touches. Yes, Disney is expensive. But, all of the little touches that make it special that are “free” once you’re in the park. 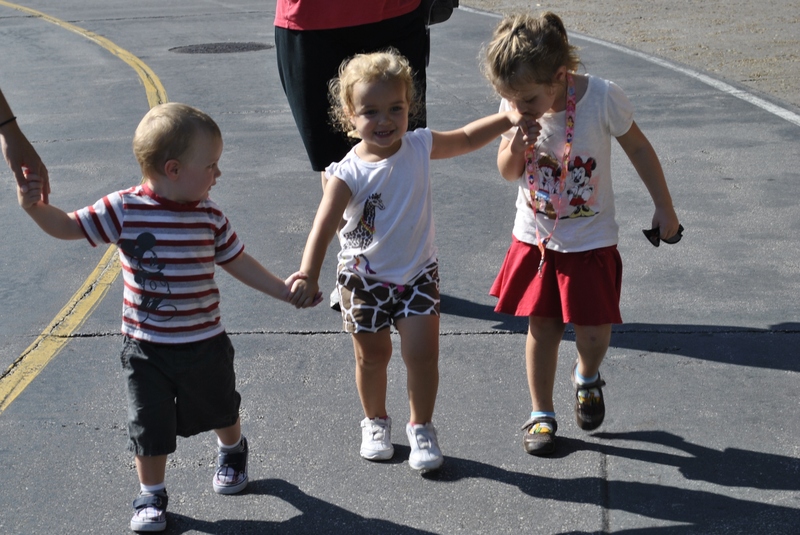 The park attendants were constantly giving the kids stickers, which they love. We were at lunch one day next to the Pirates of the Caribbean ride and they gave Taylor a treasure chest with a cookie and more stickers. She loved that. It made her day. 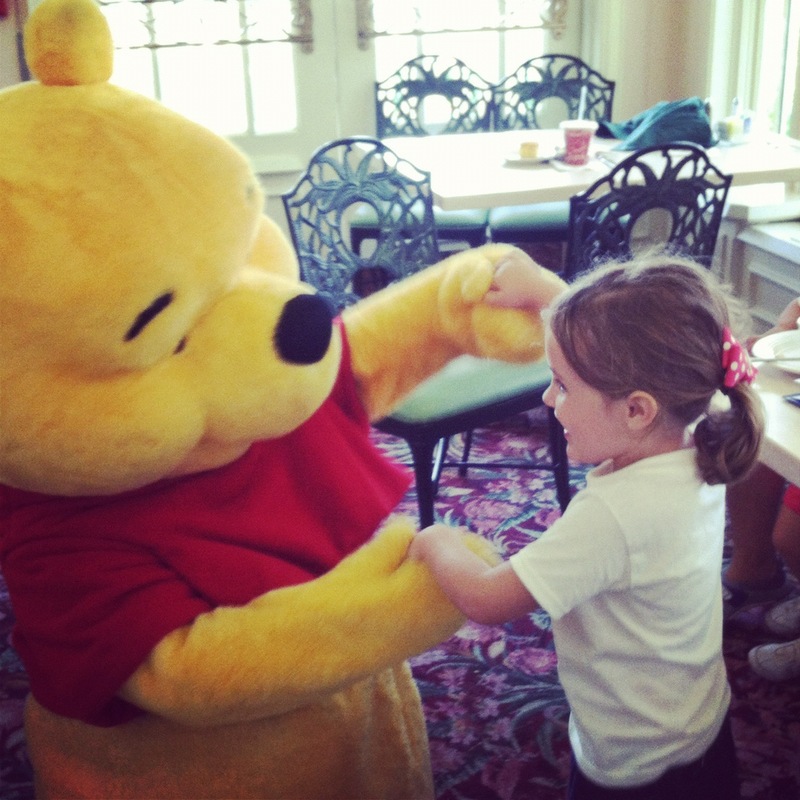 Everyone was just so nice and made our kids feel special throughout our trip. 4. The characters. We (meaning my sister and I) became a bit obsessed with meeting the characters. The kids loved it, and we encouraged it! I was so impressed with how much time each character spent with the kids, especially the characters who could actually talk. They really made the kids feel special. The two girls were in awe. Caleb took a while longer to warm up to them, but once he did, he loved it, too. 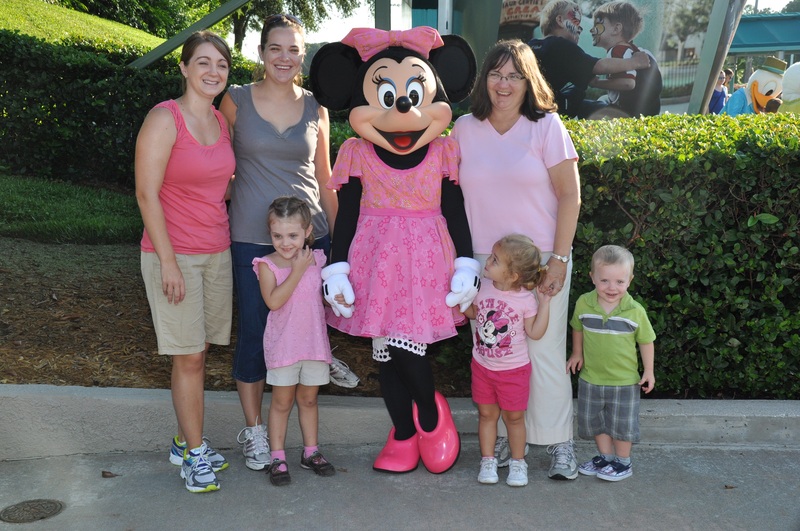 We were taking a girl picture with Minnie (the pink wasn’t planned), but Caleb had to get in on the action. 3. 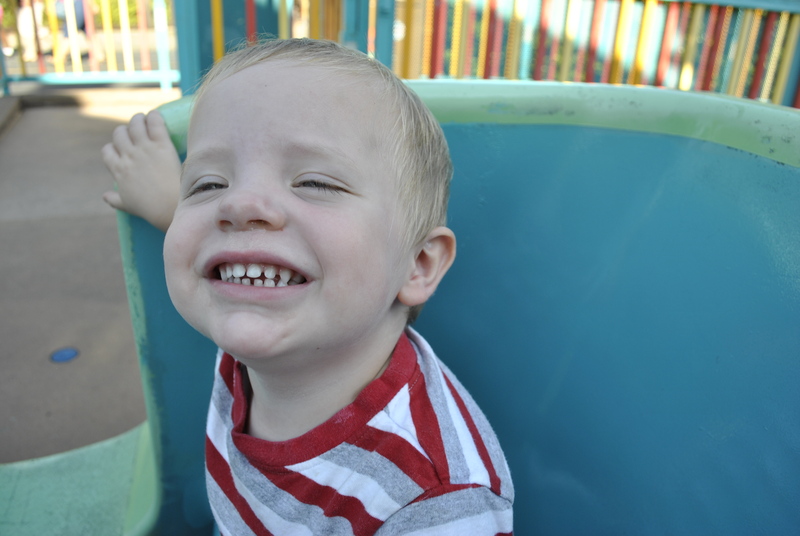 Riding rides with Caleb. 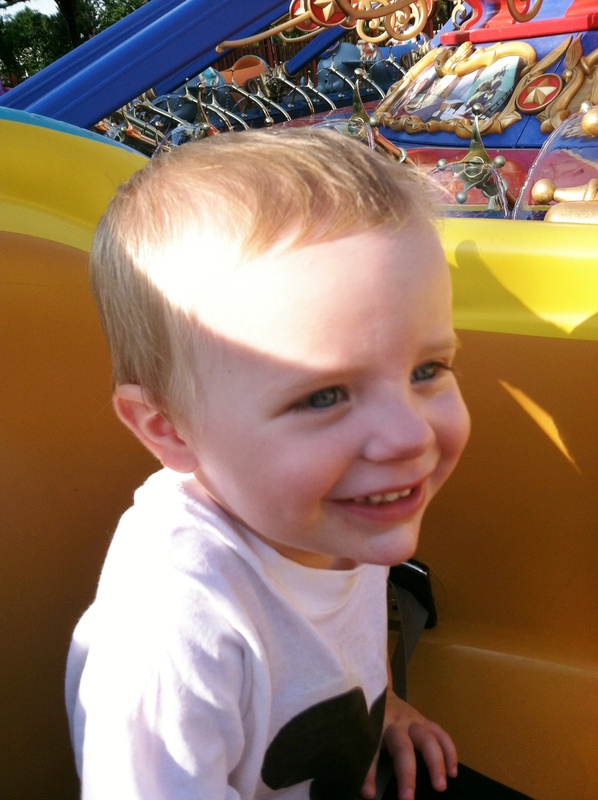 These were his first rides because he was too little at last year’s fair. He was a fan. 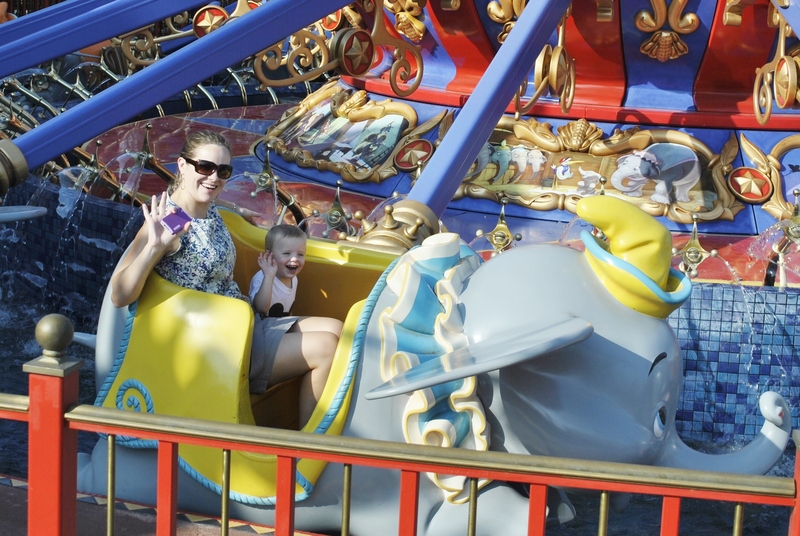 His face on Dumbo and the little dinosaur rides were just priceless. 2. Riding big rides with Taylor. I knew she loved the little rides at the fair and was always bummed when she was too short for the bigger rides. We’ve been telling her for several months that she needed to eat well so she would be big enough to ride the rides in Disney World. 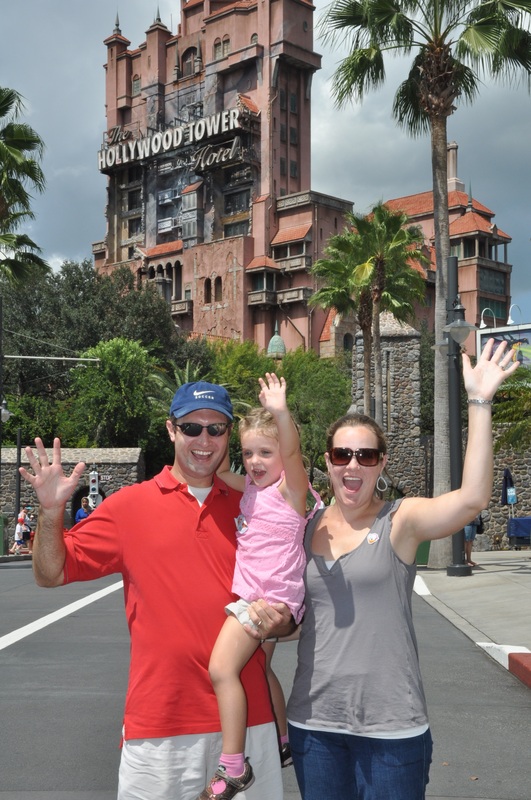 A few days before we left, I looked up the height requirements for some of the bigger rides and realized that she was tall enough for Tower of Terror and Splash Mountain and Big Thunder Mountain Railroad among others. When she got measured before going in, she told the attendant that she was tall enough because she ate a lot. 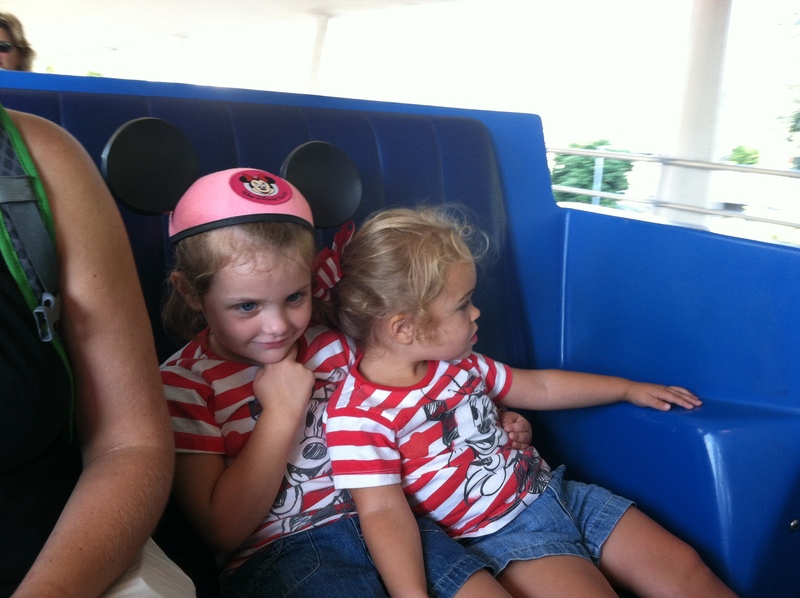 I’m glad she grew, because she had a blast on the big rides. Who knew? 1. What I will probably remember most was a moment during the parade on our first day. We had a great spot. 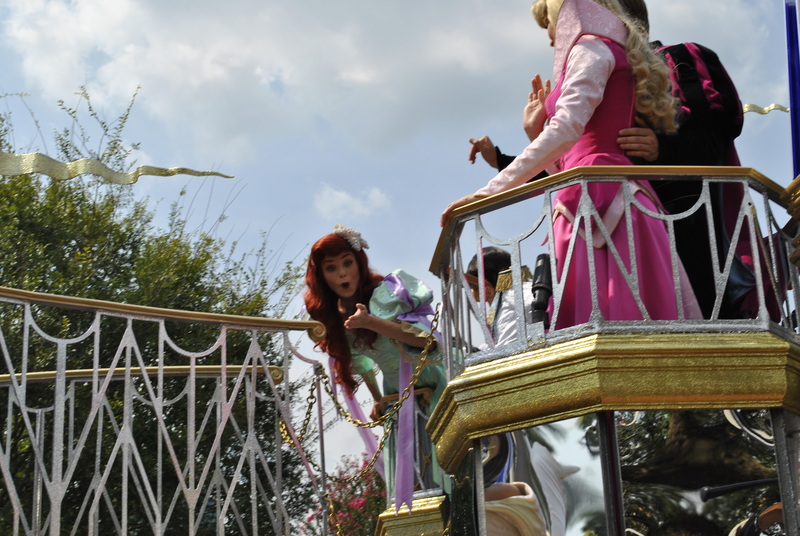 Taylor was waving widely at Ariel on her float as she rode by. 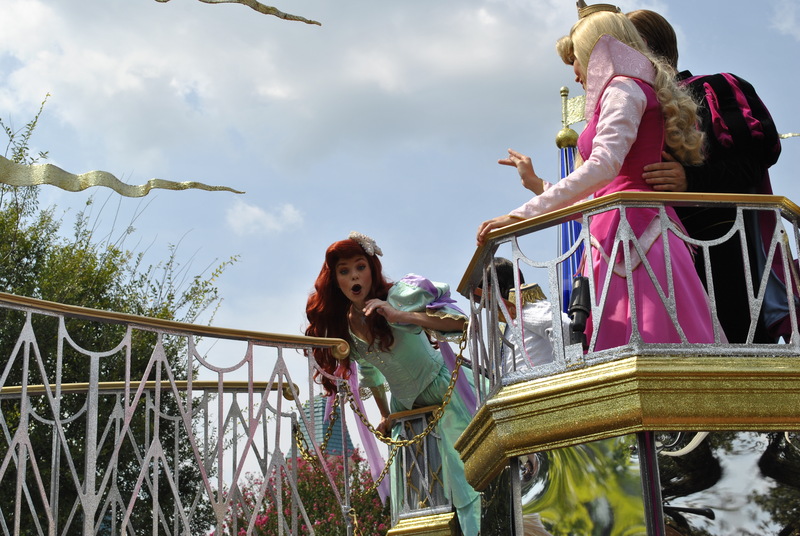 Ariel made eye contact with her, and Taylor yelled out “Ariel, you’re my favorite”. 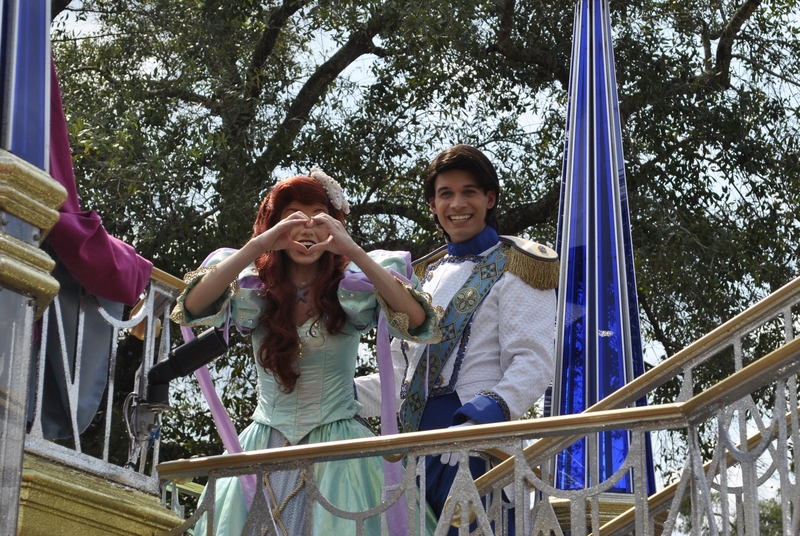 Ariel waved to her then as she rounded the corner, she turned back around to face Taylor, blew her kisses, and yelled, “I love you!” GAH, the look on Taylor’s face! You guys, I teared up! I looked over at my mom, and she was teary, too. 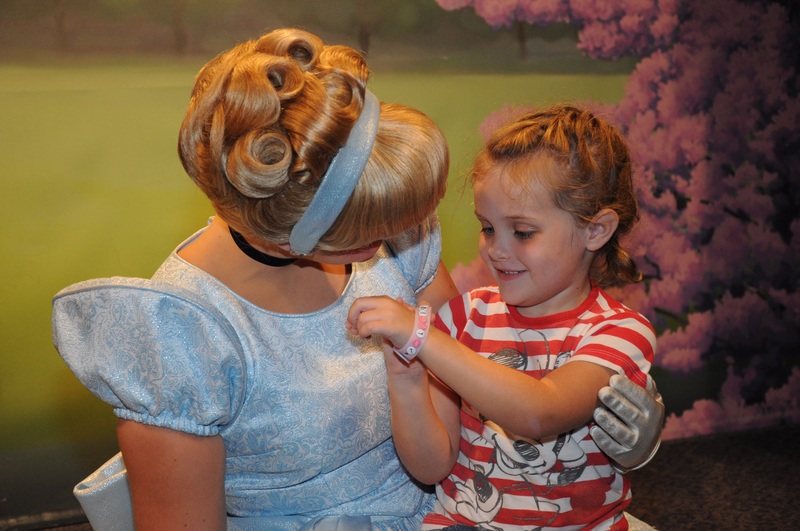 This Disney Magic stuff; it’s real. Good Times, Good Times. Can we go back now? LEIGH ANN!!! You best not be joking! Say the word, and we are there. Well, maybe not Russ – stupid residency – but the rest of us are there! I’m ready to go back.